I have just returned from delivering one of our accelerated Stage 3 KM courses in Helsinki. It was a fantastic experience with some incredible thinkers, all senior manager, in the room. All our courses open with a ‘marketplace’, where participants share problems for discussion during the course, and what never ceases to surprise me is that, regardless of the location, EU, Middle East, USA, and without fail, one of the problems will be, ‘how do I sell Knowledge Management to the _____ (insert CEO, Board, Senior Management Team, staff etc.). This is still a real problem for Knowledge Managers and I am not going to get into the specifics of project context or measurement tools, but I am going to strip things back to the basics. Usually Knowledge Managers are selling ‘up’ (to organisational decision-makers, people who hold the purse strings) and ‘down’ (people, agents, who hold the knowledge and hold the keys to the success of any system or processes you build – I keep saying this, but I challenge you to find a KM project that does not rely on people (knowledge acquisition, storage, use, generation and use) to be successful). First, who decided that Knowledge Management was important enough to hold a position in the organisation in the first place? Someone somewhere had to champion the cause and take the decision to bring the function into existence. If that person is still with the organisation, but has become dormant as your champion, then you need to reignite their passion (create an empathy map). You need to find out why they initially engaged with Knowledge Management and act upon that intelligence by engaging them in discussion on the organisation’s current challenges, which means constructing an argument (or, perish the thought, ‘selling’ your wares). If that person no longer exists, and if KM is seen as a legacy position, where people are unsure of how or why it came to be, then you need to be prepared to reignite awareness with key decision-makers (again, start with an empathy map). If you are not prepared to do this then you are not prepared to remain relevant; Knowledge Management will continue to be a function that is misunderstood, kept in a box (with the lid firmly on, usually as on offshoot of IT) or, worse still, expunged from the organisation chart in the next round of ‘right-sizing’. It is no different than selling ‘up’ (including the need for an empathy map)! Quite simply, it comes down to how you ‘pitch’ Knowledge Management, whether you are talking about organisational need, the benefits to the individuals who engage with the knowledge eco-system you create or the systems you are developing to bind the two together. It comes down to how you ‘sell’ yourself and your contribution to the organisation, as well as the people who fall within its influence. 2. Ethos: How credible are you? This can emerge from ‘Logos’ and certainly does not sit in isolation. Can you speak the organisation ‘language’? Have you done your research? Do you understand the needs of the organisation and the individuals within its influence? Are you qualified to ‘speak’ about the issues you are presenting? 3. Pathos: There are two main emotions you should be interested in here, love and fear. Can you set off the emotional tuning fork deep within the decision-maker? This is the oft-ignored element of the argument, can you identify risk? Can you present credible facts that are logical and sensible, framed in such a way that the threat to the individual/organisation is clear? Can you speak of risk? Can you speak to the values of the organisation/individual? can you align your objectives with the values of the individuals in the organisation? As Taleb says in ‘Fooled by Randomness’, “One cannot make a decision without emotion….Psychologists call them ‘lubricants of reason’”. 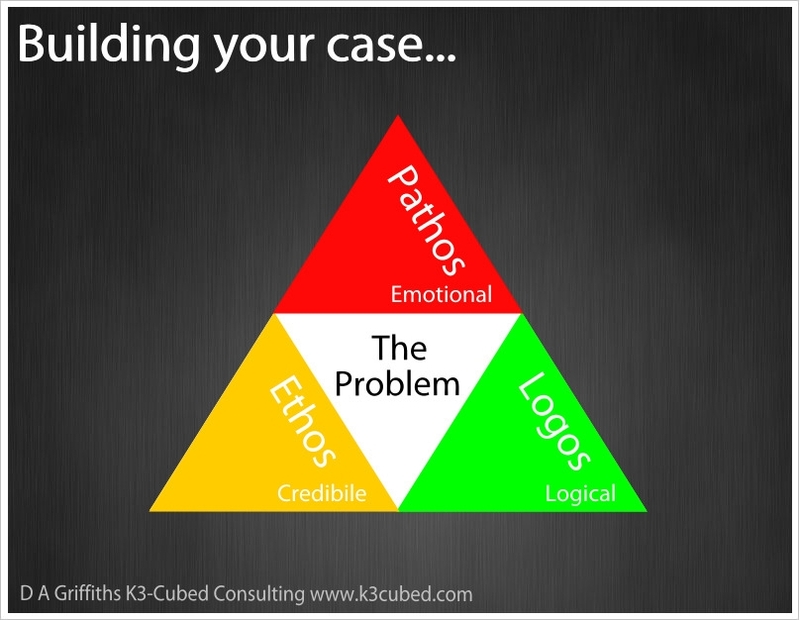 Our courses deep dive into each of these aspects to ‘build the case’ for Knowledge Management, but, regardless, if you are going to ‘sell’ KM in your organisation, start with a framework that gives you the best chance of success. If you do not then you need to be prepared to live with frustration and life is just too short to have the life sucked out of you because people just don’t understand what you do. Knowledge Management is about action and it starts with you and how you build your argument.